“This computer stuff will never catch on”. That’s what my first boss said, way back in 1980-erm. Despite his Luddite tendencies, he sent me off to a desktop publishing course, lighting a fire in my brain that would never be extinguished. When I returned to work, I dusted off the computers that were sitting there serving as bookshelves and started teaching myself DOS (yes, that’s how long ago it was). Then I started looking for ways to integrate those computers into our workflow. I was successful up to a point because there were no integrated systems in our publishing process. If I wanted to learn more, I knew I had to move on. That’s why I took an editing job with a new Canadian company, which is where I met the Mac. The attitude of our geeky computer trainer couldn’t have been more different. “Play with it; you won’t break it,” he said. That set me on a lifelong path of playing with stuff on computers and online. I had a lot of fun, and along the way I learned a lot. I tried browsers, beta software and web apps, playing with Netscape Navigator, Filemaker and haunting the beta release sites for software that would help computers do what I wanted. I soon became the go-to person in my office, at home and among my friends for anything related to online stuff. The happiest day of my life was when I was able to turn this play into paid work, working for a company now known as Appvita and reviewing web software. Sure, the reviews had to fit a particular format, but it gave me an excuse to play. At the same time, I did lots of work for free reviews sites, highlighting the pros and cons of every new toy I owned, and even doing occasional book reviews. Even today, that advice from my first Mac trainer resonates with me. It’s a great approach to life and business, because if you try new things you always learn and grow. I’m far from an expert in everything, but I’m extremely good at finding information and resources and testing them out to see what they can do and how they can help me. I now encourage others to do the same and I help where I can. I’ve unraveled the mysteries of SEO, content writing and even WordPress for many of my clients. If there’s something you have always wanted to try in your business, my advice is to try it. In most cases, it’s better to do something than to do nothing, to take a risk rather than remain bound by the status quo. If I’d listened to my first boss, I’d have shelved that new knowledge I gained and continued doing things the way I always had. Thankfully, I listened to the second guy, which is why one of my friends recently called me Tech Sharon. Have you ever had advice that changed your life? What was it? I agree that experimentation is the key to unlocking that mysterious hunk of plastic and blinking lights. And look where that first book led, Mitch. Thanks for sharing your start. 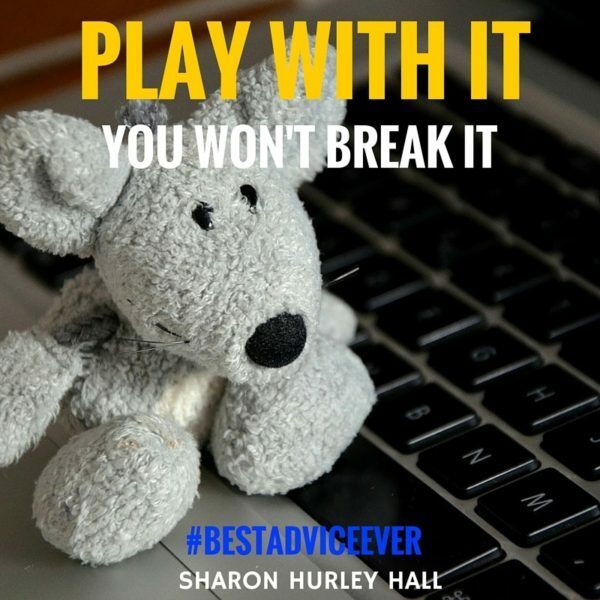 But, I have to say, you’ve truly hit the key with “play with it” and I’m so thrilled I did. I have to tell you, my WordPress site is a 3rd attempt in using WordPress for my writing site. Yep, I tried and then cancelled 2 before Kathryn Aragon pointed out I have NO CHOICE and I have to learn how to do it!!!! She literally talked me through and held my hand to get me set up and I’m grateful every single day since. She once told me my site is my “sandbox” to play in and it can be improved and changed as you learn and go so that was so…freeing, you know? But now I’m in the everyday is a new software exploration and adventure and I’m as astounded at both, how far I’ve come AND how far I have to go. I swear I learn something new about using WordPress, alone, every single day, still. 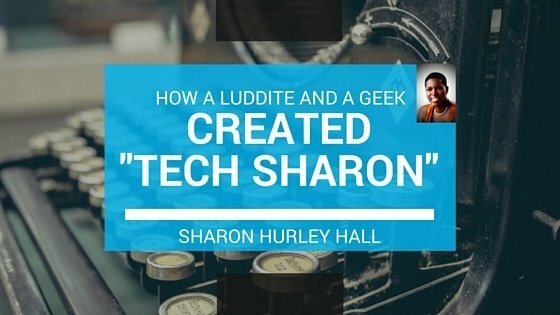 I love how you and me and we (writers) love to learn and I thank you for your generous sharing of great tech knowledge and well, much more than that, Sharon. It’s kind of nice to know you see it all as a fun and fulfilling “experiment” too and you’re giving me a little confidence today reminding “you can’t break it” to we explorers. Yes, Macs were always incredibly fun, Cathy – moving to Windows was a step back for me at the time (twins again!) But I’m still glad to have had that early lesson because it’s led to so much more learning, and some fun too! There have been a few moments of advice-that’s-changed-my-life. The first was in a therapy session as I was separating from my first husband. The therapist looked at me as I finished mumbling out my reasons for being there. “What’s it like to feel invisible?” she asked. It floored me. And it turned around my life. I realized I needed to be who I was and stop letting other people dictate ME. The second instance was sort of self-induced advice. I had applied for a position at a national magazine. The interview went well, and I was now staring at a writing test (my first really technical writing assignment). I froze. I had read sample issues and thought if I had to write that dryly I’d die six deaths with every sentence. So I said “What the hell” and wrote my own way, figuring I’d blow my chance at a real writing job. The editor hired me because, as he put it, “It’s so much better than the standard fare our guest columnists give us.” AMEN. Damn, she was right. And it turned around my perspective and my approach.